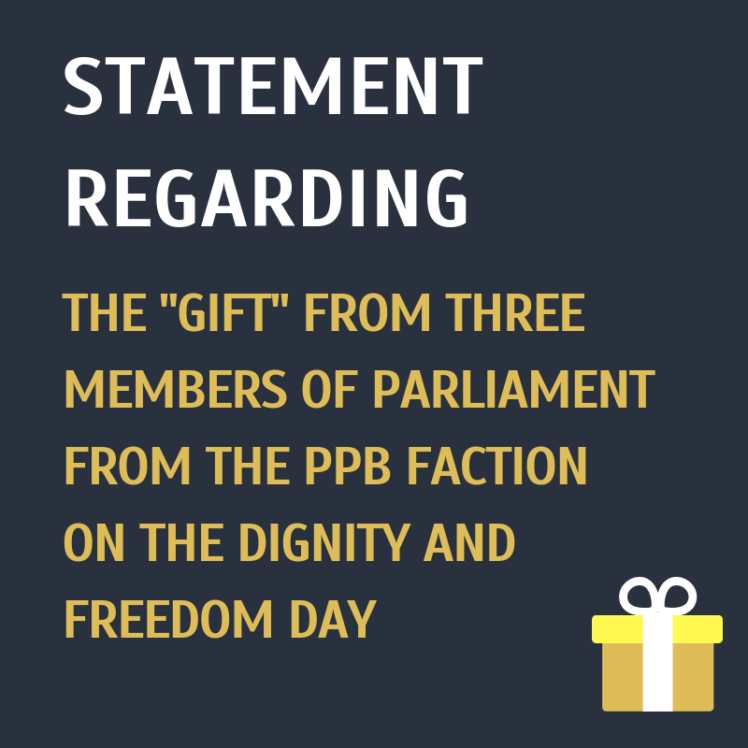 Members of Parliament Mykola Palamarchuk, Artur Palatnyi and Oleh Velikin made the “gift” for citizens of Ukraine on the Dignity and Freedom Day. They registered the draft law No. 9306 as of November 20, 2018, which is another attempt to criminalize libel at the legislative level. At the same time, the head of The Petro Poroshenko Bloc faction Artur Gerasymov stated that this legislative initiative of Members of Parliament is their personal initiative and does not represent faction’s position. The draft law establishes criminal responsibility “for deliberate spread of knowingly false information that defames honor and dignity of another person or undermines his business reputation”. The maximum sanction for such actions, according to authors’ plan, is imprisonment up to three years. This is not the first attempt under the slogan “fight against false information” to restrict free political debates and create the “cooling effect” when journalists report about corruption, violations of human rights, abuse of office and other information which is a subject of public interest. This is not a coincidence that similar provisions were provided by the “January 16 dictatorship laws”, which in 2014 were introduced to the Parliament by Vadym Kolesnichenko and Volodymyr Oliynyk from the Party of Regions faction. Later, in 2016, another Member of Parliament and at that time the owner of TV channel NewsOne Yevheniy Muraev tried to supplement the Criminal Code with the articles on libel and offense. His draft law was also withdrawn from consideration. The current attempt is ninth in a row, since the Criminal Code 2001 had entered in force. The persistence with which Members of Parliament are trying to bring criminal responsibility for the spread of “false information” and thereby get immunity from the public criticism is astonishing. Authors of the draft law refer to experience of developed democratic countries of the world, where “the practice of filing lawsuits against media is not perceived as the attempt of pressure, threat of restricting free speech but as the preventive mechanism and protection”. However, it is forgotten that the European Court of Human Rights has defined media as “watchdogs”, that means guards of democracy. In its jurisprudence, it has established the norm of greater openness for the criticism of public figures, while admitting that such critical materials may be shocking or cause indignancy. “Filing lawsuits”, which are mentioned in the explanatory note, is the instrument of civil justice, which involves element of competition during the trial. In Ukraine, the protection of privacy, honor and dignity has already been guaranteed by the Civil Code of Ukraine and the European Convention on Human Rights. These are subtle surgical instruments for weighing the “right to know” and “freedom to be left alone”. Instead of them, Members of Parliament, who stand for criminalizing the libel, suggest to set the guillotine. We want to remind Members of Parliament that they live and register draft laws not in Denmark, Iceland, Norway or Switzerland, but in Ukraine. This is a country with rather low public confidence to judicial authorities and law enforcement agencies that are being in the process of reforming for the past five years. In the view of wide area for abuses created by such legislative instruments in countries with problems of providing judicial protection of human rights, the criminal responsibility for libel and offense was abolished in Ukraine back in 2001. We appeal to Members of Parliament with a call to prevent the introduction of rudimentary and undemocratic norms in the national legislation and not to vote for passing the draft law No. 9306. We suggest MPs Mykola Palamarchuk, Artur Palatnyi and Oleh Velikin to withdraw the draft law “On amendments to the Criminal and the Criminal Procedural Codes of Ukraine on establishing responsibility for libel” No. 9306 as of November 20, 2018.